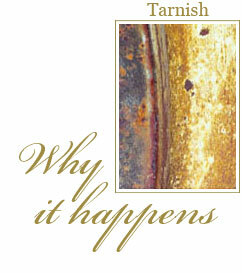 Why Does Gold Alloy Have the Best Tarnish Resistant Properties? As a general rule, the higher the karat of white or yelllow gold, the more gold present and therefore the greater the resistance to tarnishing. 18 karat gold will have superior resistance to 14 karat gold, which in turn will have superior resistance to 10 karat gold. So what tarnishes an engagement ring? Base metals tarnish because they are chemically attacked from the atmosphere and any liquid that may come into contact with your white or yellow gold engagement ring. The main culprit here is copper. This reacts readily with sulfur from the atmosphere to form sulfides. These are dark in color and your diamond engagement ring starts to look dull with time. Solders contain other base metals that are chemically attacked, which is why solder joints can quickly tarnish and become visible after a period of wear. What About a Silver Diamond Engagement Ring? Unfortunately, although it is classed as a precious metal, silver suffers from significant tarnish problems. The main culprit again is sulfur, which will form purple, brown and black sulfides on your sterling silver jewelry. And this isn't confined to sterling silver jewelry. The silver in your white or yellow gold engagement ring will also be attacked and start to discolor over time. Discolored clothing and skin usually occurs for one of several reasons. Firstly, your jewelry will tarnish as described above. This chemically attacked layer will rub off on clothing or skin in varying amounts, causing "dirty" stains. Also, as your jewelry wears, it becomes abraded and creates fine particles of tarnished material. Any fine dispersion of a metal powder will always look dull or dark, so if it is tarnished as well, this exacerbates the problem. Jewelry is very susceptible to body fluids - sweat and grease from the skin. These fluids can contain chemicals that will attack your jewelry, and they will also readily adhere. If particles form from abrasion during everyday use - and don't forget many cosmetics are abrasive and will make these matters worse - the particles will stick to the fluids on jewelry and only detach or rub off after they have built up. This means you will definitely see a dark stain! Regular cleaning of white and yellow gold engagement rings helps prevent this problem. There are several answers to this problem. First, purchase white and yellow gold engagement rings at the highest karat you can afford. As we have outlined above, this will have improved tarnish resistance over lower karats. Also, make sure you clean your diamond engagement ring regularly, removing any deposits that may be detrimental to it. The ultimate answer to tarnish-resistant jewelry is to purchase platinum jewelry. Platinum alloys are typically 95% pure, platinum is as resistant to chemical attack as gold, and will not discolor with age under the majority of circumstances. Browse our platinum diamond engagement rings.